Well, I suppose I should buy one of those color wiring diagrams I keep seeing on eBay. 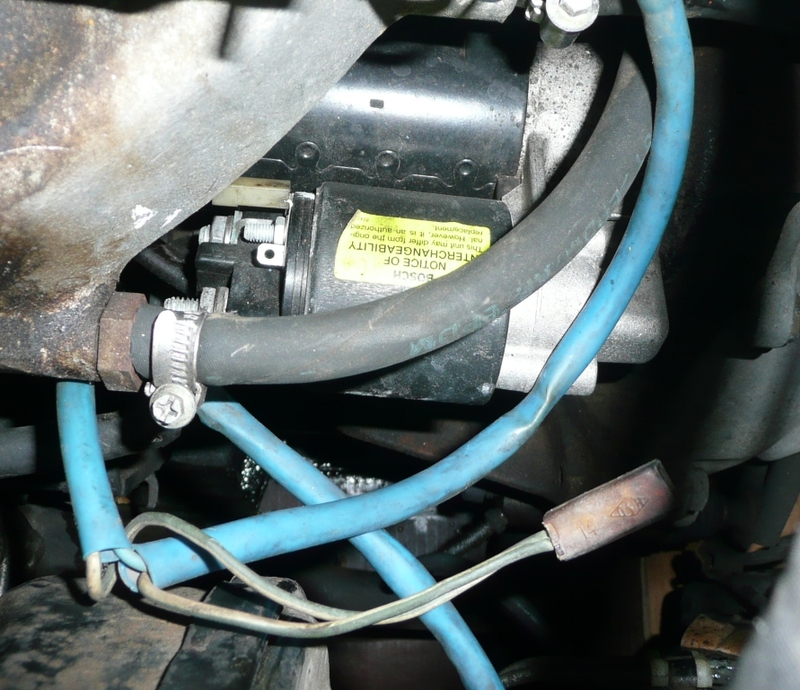 To help solve a hard start problem, I have been advised, correctly I believe, to reconnect the wires to the starter solenoid and to the coil - see pictures. Note that the PO had cut one of the wires from the connector to the coil. Do I need to re-join those two wires together when connecting to the coil? And it does go to the positive side, right? c.d., have you one of your famous diagrams? I don't see that wire in your other photo of the wires at the starter. Those loose Green/White wires are part of the emissions wiring loom. If you make that Blk/Red wire connection you should get full battery voltage to the coil during cranking. Print out all the pages in duplicate and keep a copy in your glovebox. Are you using ballast resistor on the coil? If so then you need that wire but if there is none then you don't need that wire. 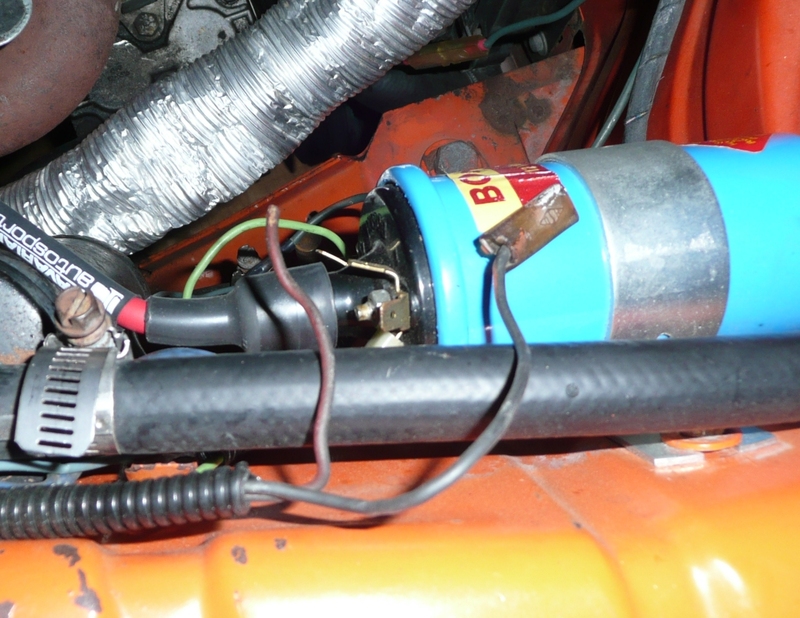 If he has the blue coil, which has the additional resistance built into it, he shouldn't have a ballast resistor before it, plus, his car is a 76 (right?) so his resistance is in the wire it-self (no ballast resistors in 76). 1) The wire that's at your coil, with the clip, I'm guessing is the one that should be connected to the coil. '+' side. 3) I see your wire connected to the solenoid where it should be. Another test: Use a volt meter to check for voltage at that hanging lead. '+' lead of meter connected to that lead, '-' lead of meter connected to ground of car. Get in the car & turn it over. You should have voltage while turning the motor over, and when the starts, and you let off the key, you should no-longer have voltage. If that's the case, then go ahead and connect it to the coil. And I think you need your old black coil back. (or get a new one, since you ditched your old one) You have too much resistance with the blue coil + the existing resistance in the wire already. That's doubling-up the resistance & knocking your voltage down, making for a weaker spark. If that doesn't solve your problem, then you can look at vapor lock again. KC Disclaimer: Double check everything I say, I'm not a certified machaniac.